Earlier this week, it was announced that in exchange for 700 million Danish kroner ($109 million), Greenland would allow Denmark a 33% stake in Kalaallit Airports, the state-owned company formed to renovate, own, and operate airports in three locations: the capital of Nuuk, the iceberg-filled tourist destination of Ilulissat, and Qaqortoq, where facilities would be built from scratch. The agreement, which gives Copenhagen a stake in the first two airports, means that the Chinese company involved in the bidding process for the construction works will now likely not be chosen to improve aviation infrastructure in a country with few roads. While it is still possible that China Communications Construction Company (CCCC) – the only non-Western company among the six bidders – could be awarded the construction contract, the fact that Copenhagen will front a large portion of the required funds reflects its desire to avoid Greenland falling into the debilitating debt trap that is becoming all too common with Chinese infrastructure projects in which Chinese banks loan the money for construction and Chinese companies carry it out. The Greenlandic Parliament’s pro-Danish decision has defused possible international controversy between the U.S., Denmark, and Greenland over Chinese investment in an island closely guarded by the U.S. military thanks to its air base at Thule. At the same time, it has has set off a political firestorm in Nuuk. As one English-language Danish newspaper described, “An apparently generous gesture from Denmark has ended up provoking a political crisis.” Pro-independence Partii Naleraq quit the coalition in opposition to Denmark’s involvement, which they see more of as an imposition rather than a magnanimous move. In a letter, Partii Naleraq (PN) reportedly explained that they “do not want to be a part of” Danish involvement in Greenland’s politics. PN’s hasty departure means that Prime Minister Kim Kielsen’s Siumut party must scramble to form a new government, as it has lost its parliamentary majority by three seats. Construction on the road to the forthcoming airport in Qaqortoq. Photo: Mia Bennett (September 2017). The domestic and international tensions over three small airports on sparsely populated yet geostrategic Greenland demonstrates that Chinese investment in Arctic transportation infrastructure, especially if it is close to the United States, can be subject to intense scrutiny. While it’s all well and good if China helps build Alaska’s liquefied natural gas pipeline, as was tentatively agreed last autumn, or invests in Greenlandic iron and rare earth mines, the potential for “made-in-China” airports conjures visions of PRC warplanes touching down on the ice. As U.S. companies have been sitting on the sidelines in much of the developing world – especially in Africa, where not just China but also Russia is increasingly making inroads – the Chinese bidder for Greenland’s €383 million airport overhaul, CCCC, has grown to be one of the world’s largest construction firms. Its expansion has occurred despite being blacklisted by the World Bank from 2009-2017 over fraudulent practices on a road improvement project in the Philippines. According to its 2017 annual report, last year, CCCC signed contracts for overseas infrastructure construction projects worth a total of $32 billion. It even attempted to purchase Canada’s third-largest engineering firm, Aecon, though the Canadian government ultimately blocked the acquisition on national security grounds. In addition, while CCCC is largely state-owned – Beijing holds a two-thirds stake – its remaining stakeholders include Merrill Lynch, BlackRock and JPMorgan Chase. Thus, CCCC already owns and is partly owned by North American companies. Map of the three airport projects in Greenland in relation to U.S. military facilities worldwide, the Polar Silk Road, and China’s airport investments in Europe. While high-profile projects like Greenland’s airports spark Sinophobia in the corridors of power in Copenhagen and D.C., worldwide, China is already running a massive amount of infrastructure behind the scenes – including transportation facilities within the U.S. The country has lately emerged as a “maritime superpower” through investment by Chinese and Hong Kong-based companies in ports around the world, including in Texas and Florida. In 2013, the Hong Kong-listed, state-owned China Merchants Holdings (International) Company purchased partial stakes in terminals at the ports of Houston and Miami. China may ultimately be shut out of upgrading Greenland’s airports, but there are enough projects at home and across Asia and even Europe to soak up the country’s funding and expertise. In 2013, China had 175 airports, but by 2020, it may have 244 commercial airports in operation. Over the past several years, as China has advanced its infrastructure construction skills in everything from aviation to high-speed rail, it has sought to move away from an oversaturated domestic market and export this expertise, along with surplus steel and capital. Chinese companies took particular advantage of opportunities to buy up infrastructure on the cheap following the 2007-2008 financial recession, purchasing stakes in London Heathrow Airport (9.5%), France’s Toulouse Airport (49.9%), and Germany’s Hahn airport (82.5%). China also enjoys controlling stakes in Albania’s Tirana Airport and Slovenia’s Ljubljana Airport and is participating in the £800 million renovations of Manchester Airport in the UK. Denmark may be able to convince Greenland not to allow Chinese investment, but elsewhere in Europe, it looks like China is here to stay. While U.S. and Danish military and government officials are probably breathing sighs of relief, Greenland’s decision aroused more negative reactions in China. One commenter on an article about the airport controversy in World Journal, a Chinese-language newspaper published in North America, wrote, “Russia has a lot of land in the Arctic, and China can develop energy in the Russian Arctic, killing the US!” Russia is one of China’s most willing partners in the Arctic, welcoming billions of dollars of investment in the Yamal Liquefied Natural Gas Project and remarking positively on its overtures to turn the Northern Sea Route into a “Polar Silk Road,” as expressed in China’s Arctic Policy. Although China’s investments in the Russian Arctic should not prove to be a mortal blow to America, expanded cooperation and exercises between the Russian and Chinese militaries may give the Pentagon pause. Last month, China’s first purpose-built container ship for sailing in polar waters plied the Northern Sea Route. The notion of Chinese destroyers one day following in its watery path may seem far-fetched, but then again, who could have predicted even a decade ago that it would not be American oil and gas companies investing in the Russian offshore, but Chinese ones? China’s attempts to bring Greenland into the Polar Silk Road may be stymied for now. But its scientific, infrastructural, and even tourism-based advances in the Arctic are undeniable. With a new icebreaker in the wings and warm diplomatic interactions with Iceland, including the scheduled opening of the China-Iceland Joint Aurora Observatory next month, small efforts such as curtailing Chinese investment in Greenland’s airports will do little to turn back the tide. This post was updated on September 25 to reflect that the agreement between Greenland and Denmark only pertains to the airports in Nuuk and Ilulissat and that CCCC has not been formally ruled out as a construction contractor – just that it will not provide the funds for construction, though it is now unlikely that CCCC will win the contract. In addition, CCCC’s attempt to acquire Aecon was ultimately blocked, which has now been noted in the post. Thanks to Martin Breum, Hans Andraessen, and a third anonymous reader for providing clarification on these matters. I apologize for the errors. Interesting. On St. Lawrence Island, a scant 38 miles from Russia and with ancestral ties, the two Siberian Yupik villages, more heavily reliant on a traditional life of hunting than the rest of Alaska, climate change is causing emergency food security issues. The cold stream that ran from our island to St. Matthew has disappeared with the ice, already causing changes. There is tremendous uncertainty over future changes. The island is privately owned by the Indigenous residents, who have high poverty and unemployment rates that exceed 80%, a long time refusal to develop mineral and ither resources in favor of conserving the food rich environment may have to be reconsidered, given that we are directly on the New Silk Road, and all the proposed shipping and such is sure to impact the ecosystem further. There may unfortunately be no choice but to develop, for survival. This may be an interesting story for you, Mia, and I appreciate your coverage of important issues concerning the arctic. Thank you so much for bringing these issues to my attention. I’ll have to look more into the matter and maybe I could write a blog post on it sometime. If you have any resources, references, or contacts you could send my way, I’d be grateful. Mia, another clear and concise post..thanks. I have amplified via W2O FB. Will you be at Arctic Circle? Let’s find a moment to chat amidst the tumult? Thanks for reading. Yes, I will be at AC – let’s touch base there. It will be nice to catch up. I am great fan of Cryopolitics, so pls accept this as a friendly comment to an otherwise clear and bright analysis. The new agreement between premier Løkke Rasmussen , Denmark, and premier Kielsen, Greenland, covers only two of the planned three airports in Greenland – not all three of them, but only the airports in Nuuk and Ilulissat. Also, the agreement does not rule out that China Communication Construction Company, which has been pre-qualified by Kalaallit Airports, will end up doing the construction. The concern in Denmark has been that Greenland would not only ask CCCC to do the construction but also borrow the necessary funds in China, perhaps through CCCC. This, according to the Danish government, would have created a risk the Greenland would end up in a debt-trap. The new agreement has many purposes and less obvious goals, but one of them is clearly to eliminating this risk as it provides all the funding needed for the two airports – on top of Greenland’s own input. One may surmise that it is now politically unlikely that CCCC will be chosen as the main partner to the new company that will be established to build the two airports, but the new deal does not formally rule it out. Finally, you say Greenland is dominated by the US / Thule Air Base. Your own excellent reports from Greenland have illustrated that “dominated” is perhaps a somewhat rich term in this context. Dear Mia thanks for putting the debate on Greenland’s airports into perspective – yet a super piece of cryopolitics. A few additional details could be added. 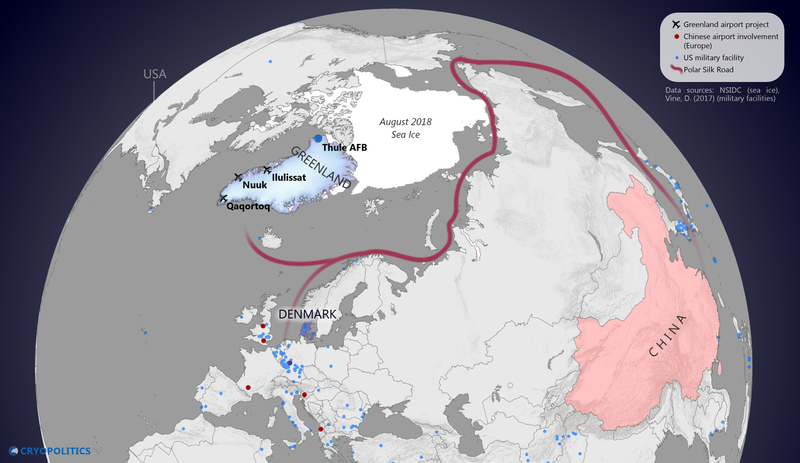 The new deal between the Danish prime minister and Kim Kielsen, Greenland’s Premier, covers only the airports in Nuuk and Ilulissat and not the one proposed for Southern Greenland. Also, judging from the wording of the deal and from the last couple of years worth of political debate here in Copenhagen it seems that the Danish government’s motivation for entering into this deal goes quite far beyond its fears of Chinese engagement. It is certainly true that the Danish primeminister and others voiced grave concern that Greenland should opt to borrow funds for the airports in China, but the renewed Danish desire to support economic development and infrastructure in Greenland, thereby also illustrating the value of the Danish connection to those who live in Greenland, traces back to before this Chinese prospect became apparent. This is important also if one wants to understand those in Greenland who are opposed to the new deal. They are apparently less preoccupied with China, more with the prospect of arenewed and rewamped Danish presence and investments in Greenland`slargest ever infrastructure project. In many way`s it seems that Greenland`s political leaders have been over the last several years may have been at least as eager to engage with China as China has been to engage with Greenland. Thank you for sharing your detailed perspectives, and please accept my apologies for my delay in responding as I have been traveling. In response to your first comment, I’ll edit the post to reflect the fact that it is still possible that CCCC could end up carrying out the construction work. Denmark’s desire to assist Greenland avoid the debt-trap seems reasonable to me given other instances of countries like Sri Lanka falling victim to these circumstances. I suppose the word “dominated” is a strong one, which had occurred to me when writing, but I was not sure how else to phrase it. And in response to your second comment, I will update the post to reflect the fact that the agreement does not actually include the airport in Qaqortoq. Will you travel to Arctic Circle next month? Thanks for an interesting article. However, the agreement with the danes does not include Qaqortoq, as far as I know, they did not include it in the agreement. And the municipality, called Kommune Kujalleq, is not very happy about it. The talks abuot an airport in Qaqortoq, have been up for discussions for a couple of years now, and it seems that it’ll be one of the topics when the parliament starts their discussions about the airport investments. Thanks for your comment and sorry for not responding sooner as I have been traveling. It’s my oversight that the agreement with the Danes does not actually include Qaqortoq – I will amend the piece to make a note of this.